I left my house at 7:08 this morning and except for lunch and quick soccer game with Johnny I worked until 4:15 this afternoon getting 98 pieces of wood. 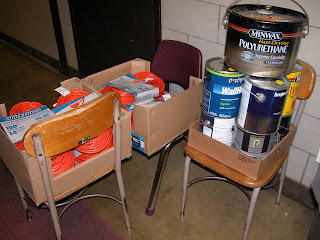 Well, I guess I got all the electrical and paint for the tables, too. Electrical stuff shown on top of one of the original computer-embedded tables. Yesterday James, Ed and I final-final-finalized the design for the table, still making a few important changes. I can't speak enough for social intelligence, also called group intelligence or collective intelligence. As I don't see how it's possible to quantify quality unless it's referenced to some measurable criteria (and thus is no longer quality! ), I oughtn't have said this team synergy improves the design 5 or 10 fold. How can you quantify creativity? Inadaquately, at best.